For a Manchu emperor a musket would have been an object of the utmost importance and pride. Brilliantly designed and exquisitely crafted in the imperial workshops, using luxurious materials, this impressive imperial gun was created for the Qianlong Emperor (1711-1799, r. 1736-1795) of the Manchu Qing dynasty, and bears not only the imperial reign mark, but in addition the exceptional grading te deng di yi, ‘Supreme Grade, Number One’, which is not recorded from any other known extant gun from the imperial workshops. This musket seems to be the first Chinese firearm with an imperial reign mark to be offered at auction. Imperial muskets were created in only very small numbers by the Manufacture Department of the Imperial Household for the Qianlong Emperor, who gave meticulous instructions on how they should be created, repaired or modified, for instance the sort of wood or form of reign mark used. Besides the ranking, which is incised in Chinese and only visible when the gun is taken apart, the barrel of the present musket is also inscribed with a Manchu word that is difficult to interpret with certainty. It may be transliterated as ‘g’ū’, corresponding to Chinese characters pronounced gu, and may represent the surname of the artisan who made this piece and would have been held responsible for his work, as musket barrels could explode if poorly made. 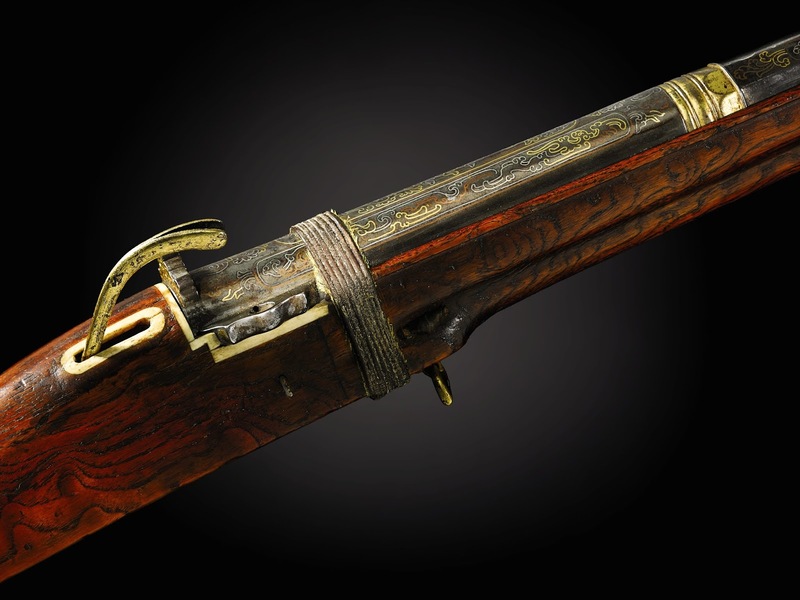 This Superb Imperial Matchlock Musket was sold at the Sotheby's auction with price of 1,985,000 GBP.